Katie’s Blondies are incredibly delicious and may not have found their way into my life had I not started blogging. I don’t think I ever chatted with you about how I got started blogging. I would not have been able to tell you what a blog was six months before my site went live. 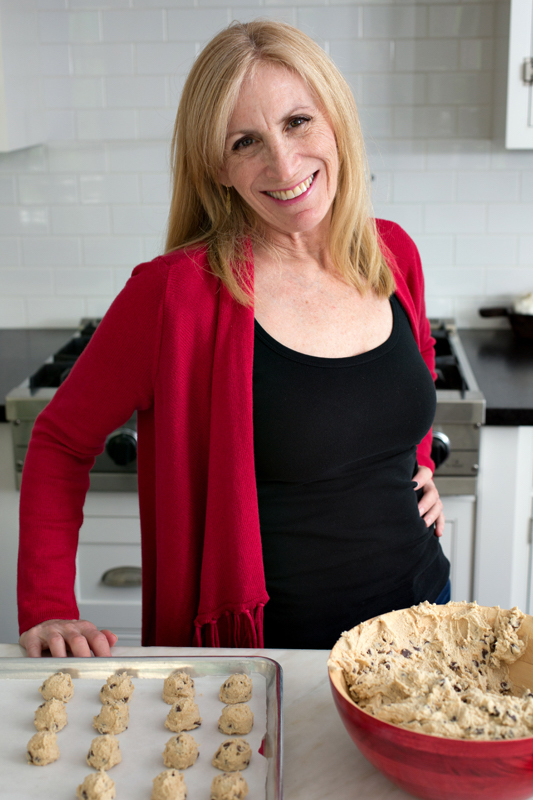 I have always loved sharing and teaching the love of baking and have known that I was interested in finding a new avenue through which this could be accomplished. I learned how to blog and have always moved forward with Desserts Required believing that the next stepping stone is just under the surface of the water in front of me and when I am ready to take the leap onto it, the stone will appear. Fortunately for me, this has been the case throughout my blog journey. Why share this now? Because last weekend I went to a Food & Wine Conference for Bloggers in Orlando. The event was put together by fellow blogger, Isabel Laessig of Family Foodie, and was one of the most impressive conferences I have ever attended. Each speaker brought his/her expertise to the room and it was clear to me throughout the weekend that everyone truly wanted to share information to help each of us grow. I learned more about the blogging world in three days than I had learned since I started Desserts Required. One of the speakers was Katie Workman. I had heard of The Mom 100 Blog, but had not seen Katie’s The Mom 100 Cookbook nor had I heard her speak. Katie is witty, clever and knows what she is doing, a winning combination in my book. Katie stepped in at the last minute to do a cooking demonstration of recipes that were not her own and recipes that included crepes, something that she had not made in many years. Katie pulled off the demonstration without setting her hair on fire (one of her great tips for a live cooking demonstration) or burning the food (another important thing to keep in mind). Katie called on me and I answered, “Humor.” It was clear from Katie’s face that this was not the answer she had in mind. Yet, it was also an accurate answer and I won the book. WOOHOO! I came home from the conference and started reading The Mom 100 Cookbook like a novel. To say that I was spot-on with my answer to Katie would be an understatement. I mean, seriously, in the introduction Katie talks about a very old television commercial where there is a woman standing in perfectly clean clothes, perfectly coiffed hair, perfectly applied makeup, who is singing about bringing home the bacon, stirring it up in a pan and never, ever letting her man forget he is a man. Just like real life, don’t you think? It was then that I knew I had to bake something from this cookbook. One of the beauties of The Mom 100 Cookbook is that the recipes are designed for those of us who need to fit 39 hours into a 24 hour day, which pretty much means all of us. I picked Katie’s Blondies because Blondies are one of my favorite bars. I was pressed for time and found the recipe could not have been any easier. Basically, it is a two bowl cleanup. One bowl is used to whisk the dry ingredients together and the other is the saucepan where everything gets mixed. There was one major problem. I could not stop eating my Blondies, which reached the point of being dangerous, at least to my wardrobe. I decided that I had to get them out of the house and took them to Samuel’s tennis lesson. Not that I really needed the confirmation of how delicious they were, but it always feels great to share treats and see the sheer pleasure on the faces of those eating. While I ponder my next stepping stone, I am going to sit back, enjoy reading the rest of The Mom 100 Cookbook and dream of my next batch of Blondies. Preheat the oven to 350°. Line a 13” x 9” baking pan with parchment paper and set aside. Melt the butter in a medium saucepan. Remove from the heat and stir in the brown sugar. Set aside for at least 5 minutes. Combine the eggs and vanilla in a glass. Set aside. After the butter/brown sugar mixture has cooled, quickly add eggs/vanilla so that the eggs do not cook. Stir in the dry ingredients. Lastly, add the chocolate chips. Transfer to the baking pan and bake in 350° oven for 24 minutes, rotating the pan halfway through. Remove from the oven and cool completely before cutting. Once cool, lift the parchment paper out of the pan and transfer to a cutting board. Cut into 24 bars. Both light and dark brown sugar work beautifully. Personal preference will dictate which is used. Nuts may be substituted for chocolate chips or use a combination of nuts/chips to equal 1 cup. My edges always rise a bit higher than the rest of the Blondies. For a pretty presentation, trim crust edges off before cutting Blondies. The edges are a delicious snack. I prefer moister Blondies. If you prefer them cakier, bake for a total of 26 or 28 minutes. So happy you love the book! So happy it went to you! And so happy to have met you. Same here…on all accounts! Thank you for inspiring this post. These sound delicious, I love blondies and I love Katie’s book. Thank you for your comment. Blogging about Katie’s Blondies was sooooo easy to do because the book is sooooo fab! Good for you! I love the addition of the photos of the writers. Thank you for noticing the links back to both Isabel who put together the conference and Katie, the inspiration for this post. I think it is important to give proper credit where due and hope my readers take the time to check out some very talented people. I’m so glad you shared these! Brownies are always on my menu now 🙂 And it was such a pleasure to meet you at the conference. I would never have guessed your blog is a mere 6 months old! Thanks so much. I loved meeting you at the conference. Your spirit and energy make every room you walk into a happier place. BTW, I wish I was this far along when my blog was 6 months old. Desserts Required started in October 2011, so I am coming up on my 2 year anniversary. Woohoo!! I love Blondies, and yet I’ve never made them. This recipe will likely change that―especially by the depiction of the oozy chocolate zoomed in from your lens. I’ve never been to a blogger conference either. I think I should get out more often. Just as soon as I polish off a pan of these beauties. 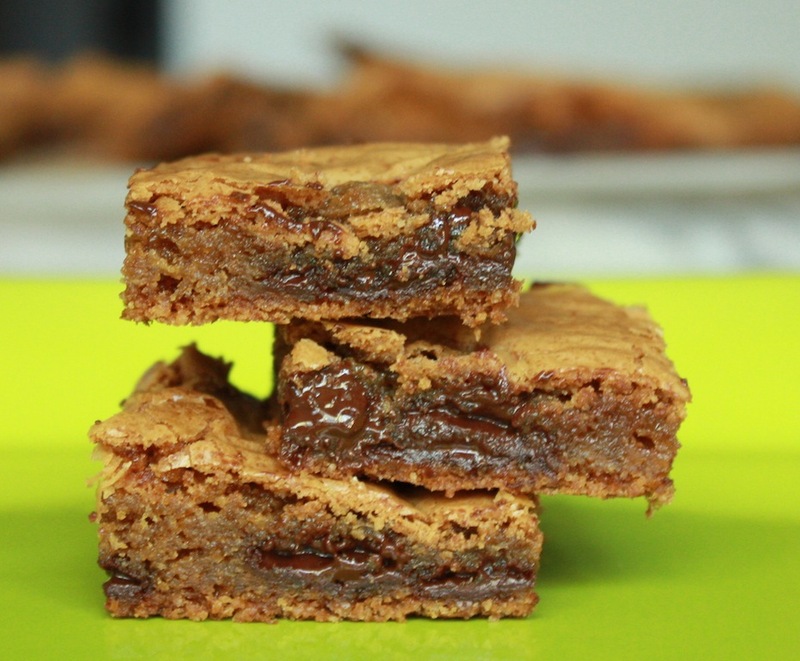 Katie’s Blondies are the easiest treats I have ever made. My problem is that they are so hard to stop eating! Long time reader, first time posting. I knew I could count on this blog. Just what the doc ordered! I think we had the same mom baking for us! Thanks so much for your wonderful comments. I made these two days before I plan to serve them. I had intended to freeze them. Would you suggest freezing them or putting them in an airtight container? I am concerned they will not be as fresh two days from now. Thank you. I suggest freezing them for the two days. After they have baked and cooled, store them in an airtight container in the freezer. On more thought regarding freezing: what do you think about freezing it before I cut it? Great way to do it!! Wrap very tightly in plastic wrap and aluminum foil. Made these again tonight. There was a major problem: there was only one that would not fit on the tray that I was making to take to friends. I solved that problem. I moved them around, until a second one wouldn’t fit and I ate that one, as well. They are delicious and, absolutely, one of the easiest recipes I’ve ever made. Too funny, Macky! You came up with the PERFECT solution! !